Classic Crime. London. What’s not to love? I’ve been reading this book for quite a while, but don’t let that length of time fool you. 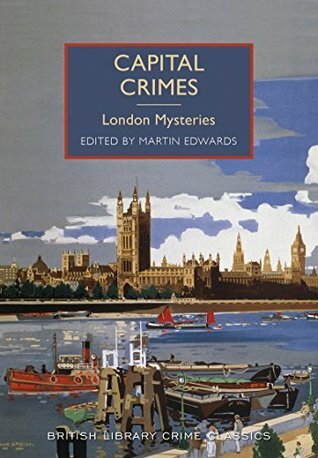 This is a collection of short story classic crime mysteries, all set in London. Every story found in this collection is different. Instead of sitting down and reading this book in it’s entirety, I’ve been enjoying it over the course of two months, picking it up and reading a short mystery here and there. I liked how editor Mr. Edwards provides not only an introduction to the overall theme of the book, but also an introduction to each story. He gives information about the author, and their writing style or the story, adding incite to each adventure. This was particularly useful information for me, as I was unfamiliar with the majority of the writers in this collection. I think we all know Sir Arthur Conan Doyle, who has the honor of having written the first story in this collection, The Case of Lady Sannox. I expected to find a classic Sherlock Holmes art of deduction-type story, and instead was treated to something very different (with no Sherlock to be found). The stories vary – some are suspenseful, others an armchair detective whodunit. There are amateur sleuths and Scotland Yard detectives. The publication years range from the late-19th to mid-20th centuries. Each story is unique. The piece that binds them all together is the city of London. I really enjoyed this book. It is great when you want to read a short mystery, and the wide variety of stories ensure that there is something for everyone. I’ll leave you with a few of my favorite quotes. “But so far I’m all in favour of letting sleeping dogs lie.” Not unnaturally Mr. Carlyle had heard that line before and had countered it. “True, but it is as well to know when they wake up again,” he replied. And now the district, as you will remember, was given over, not to panic, for the London public never yields to that, but to apprehension and dismay. Is it chance every time, or is it Providence avenging the victim? If this book sounds like your cuppa, be sure to check out Resorting to Murder as well. Many thanks to NetGalley and publisher Poisoned Pen Press for providing me with an advance copy of this book in exchange for an honest review. Both books were fun, you can read a mystery and then go back to another one later. I liked the London collection better. The holiday stories were good but (for me) just not the same as a good old classic London mystery I guess. I hope you win one or both!! Yes they are fun to pick up and read a quick mystery. Large variety in the stories. I hope you like them!